Tawn and I are wine drinkers. I wouldn’t call ourselves “aficionados” and there’s a lot we don’t know about wine, but we enjoy a nice bottle and have a small wine cellar at home and like to explore different varietals and vintners. Sadly, though, the tropical paradise of Thailand is no paradise for wine drinkers’ wallets. 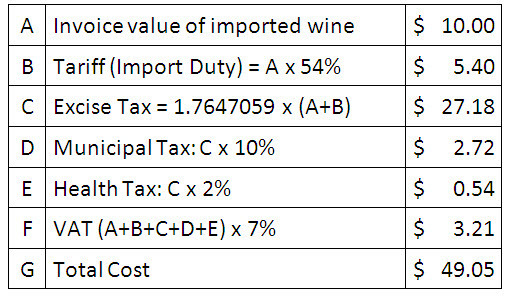 Wine, extremely little of which is produced locally, faces a hefty import duty on top of which the government places an even heftier excise tax, since wine is, in their judgement, a luxury good. Beer and cheap Mekong whisky, however, apparently are not. Recently I was commenting longingly on a post by Gary in which he dined at a “wine-centric” place in Glendale called Palate Food + Wine. They had these wonderful wines at very reasonable prices – $9 here, $17 there – and that was after restaurant markup. In my comment, I complained about our 300% duties here in Thailand. That got me curious: what, exactly, are the duties, taxes and tariffs on wines here in Thailand? That’s a 390% effective duty, tariff and tax burden! Outrageous! If there is any good news out of all of this, Free Trade Agreements signed with Australia and New Zealand are moving their tariffs (currently 24% and 18%, respectively) to zero over the next half-dozen years. But that is only the tariffs, not the excise tax, etc. Is it any wonder that when I’m back in the US (not to mention visiting Australia), I try to have wine with every meal? This entry was posted in Uncategorized and tagged food, Taxes, Thailand, wine by christao408. Bookmark the permalink. holy cow! Yeah stick to illegal imports of wine in your luggage! Awww… poor you! Wine isn’t particularly expensive in India. A glass of wine will range anywhere from Rs.500 ($10) to Rs.1500($30) or more. The cheaper ones are locally produced (India has got an increasing number of vineyards which produce quality wines)and the expensive ones are obviously imported. Like you, I am a wine drinker too and I appreciate a good glass of wine even though I know nothing about them! @Roadlesstaken – That is one allergy I am particularly thankful not to have! @Redlegsix – There are a half-dozen vintners here in Thailand, mostly located up in Khao Yai but one in Hua Hin and another up near Chiang Rai. They market these as “new latitude wines” but I describe them as “not quite there yet”. Even at that, they are subject to all of the above tariffs, etc. except the initial one. @Dezinerdreams – Those are the prices for a glass of wine? Sounds pretty pricey to me. My reference point is that $10-15 should buy me a decent bottle of wine, not a glass. At a restaurant, even in SF, I would expect to find several good wines for under $30 a bottle. @doiturselfer – While I’ve moved away from these the past two years (stocking up on other things), I have been building a small stash in my sister’s basement and may start bringing nicer bottles over again. @ElusiveWords – I’d get out the smelling salts to revive you, but those have a hefty duty, too! And I thought NY state and NYC charged some outrageous excise taxes! How many duty free bottles are you allowed to bring into Thailand when you travel? @christao408 – Yeah, I was talking about a glass. Drinking in restrobars/clubs are always expensive when compared to buying from a store. In a store you can find a bottle for as little as Rs.350($7) for the local ones. whoa, that’s crazy! and here i was complaining about these blue state laws that prevent alcohol from being sold in grocery stores… compared to what you pay i’d say we have it pretty good! Wine is nice… though I know next to nothing about them…my sister is the expert with that.You two look so lovely in that photo! Oh Chris, the prices I mentioned are the sticker prices I saw at the wineshop, and yes they seemed so reasonably priced!. Of course, there are other varieties from Bordeaux which retails for US$50 and above. Well, I know what to bring you guys on my next trip to the Big Mango! Maybe I should start a import/export business afterall! What’s the restriction on bringing wine to Thailand? @Wangium – @TheLatinObserver – 1 L per person (although most bottles are .75 L)@Dezinerdreams – That’s a hefty mark-up, but not that bad compared with Thailand’s restaurants. Do most restaurants there allow off-premises wine to be brought in? Corkage fee? @kunhuo42 – I lived in Kansas for 14 months before moving to Thailand, right about the time the state legislature amended the law to allow each county to decide whether to be dry on Sundays. It was so nice to finally be able to buy wine in a liquor store seven days a week! @ZenPaper – Thanks. My friend Ryan took the photo. @CurryPuffy – No need to bring us anything except your presence! @Wangium – That’s 1.5 though, isn’t it? @christao408 – Nope! You are not allowed to bring anything in. @Dezinerdreams – Really? No duty free? @christao408 – how about other forms of alcohol? still as expensive or what? The Architect and I are wine drinkers. I would be so upset if I had to pay that much just to drink wine! Hopefully things will change in Thailand! @yang1815 – Imported liquors are subject to all of the above. Imported beers don’t have the excise tax (C) because they are not considered luxury items. Get this – domestic wines, while not having the import duty (B) are still hit with the excise tax (C) because they are considered luxury items! It is really hurting the nascent wine industry here. @TheCheshireGrins – I hope so, too. Thanks. Foodland has cheap (relatively speaking) wines.. I think if you go to Took lae Dee for dinner you can get decent ones for 90 baht per glass. My colleagues (some Brits, some Americans) go there all the time! @Poom – Thanks for the recommendation, K. Poom. Where is Took lae Dee? And we’re talking about ภูกและดี right?